Pipet tips with special filters, to effectively prevent the pipettor shaft from contamination with aerosols and liquids to be sucked into the pipettor. 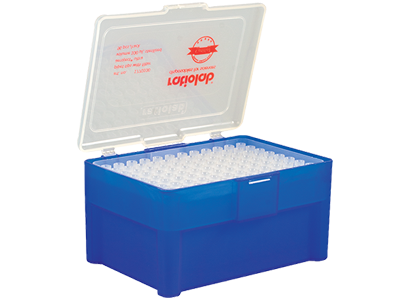 1770010 ratiolab® aeroject ultra tips, 10 µl xl, sterilized 960 pc. 1770020 ratiolab® aeroject ultra tips, 20 µl, sterilized 960 pc. 1770100 ratiolab® aeroject ultra tips, 100 µl, sterilized 960 pc. 1770200 ratiolab® aeroject ultra tips, 200 µl, sterilized 960 pc. 1771000 ratiolab® aeroject ultra tips, 1000 µl, sterilized 600 pc. 1771000XL ratiolab® aeroject ultra tips, 1000 µl X L, sterilized 960 pc.